Creating beautiful, decorative, large-scale ceramics. I have been around clay my whole life. Born to parents who both work in clay, I found it natural to return home to work in their studio after studying art at Hope College in Holland Michigan. I began by learning basic techniques and working as an apprentice. Over time, I took over the majority of production work and in the past several years I have developed my own style through large scale forms. I currently enjoy experimenting with 3-6 foot tall decorative vessels that take a great degree of physicality and strength to create. 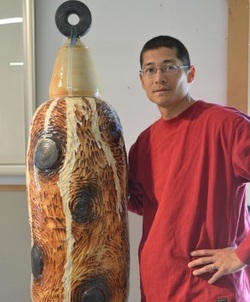 I enjoy the challenges that come with working with large forms and feel that the vases become canvases for unique carving and glazing styles. My work is influenced from both my parents, who use natural, earth tones as well as Asian-inspired design. My pots are fired in wood, electric, and gas kilns, all which offer a variety of atmospheres resulting in unique and unusual surfaces.